Strong GCSE results have been celebrated at one of the highest achieving comprehensive schools in the country. 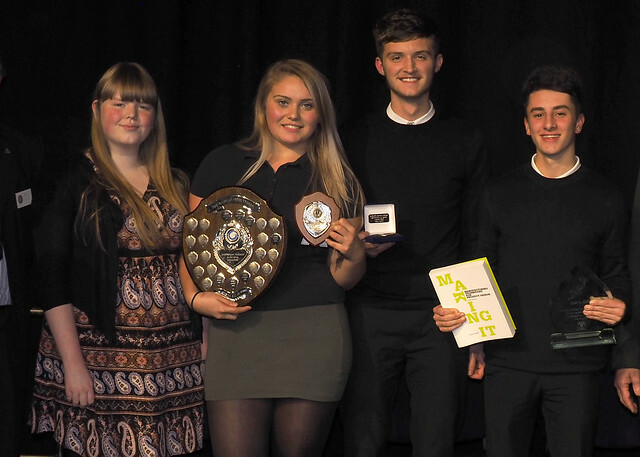 Students at St. Mary's, Menston performed well in the exams, with some outstanding individual results - and they were rewarded for their hard work at the annual Year 11 Achievement Evening. There are many challenges facing Year 11 students taking GCSE examinations, with numerous changes to the examinations framework. The result of this is that coursework and controlled assessment has a reduced impact on results in many subjects and examinations are linear, taking place at the end of the course rather than modular examinations taking place throughout the course. Despite this, St. Mary’s again achieved strong results, with students of all abilities achieving their aspirational targets and many progressing into the St. Mary’s Sixth Form. Guests of honour at the evening were Sylvia Wright - who has devoted her life to working among the sick and disabled in a very poor area of India - and Tony Hartigan, retired Headteacher and Trustee of The Sylvia Wright Trust. The trust is a registered charity set up and run by Sylvia to support her work in the Indian State of Tamil Nadu. Sylvia sold her home and possessions in Leeds 33 years ago to work among people in desperate need. Since then she was built a hospital, a school for deaf children, and two centres for severely disabled children. She also runs a number of vital community health projects. In 2009 she founded a Nursing College. Her trust is supported by 18 schools in the UK as well as by three universities. It has strong links with St. Mary's where students regularly fund-raise to help her vital work. During the achievement evening Sylvia and Tony described the work of the trust and presented GCSE certificates and subject awards. The event was a very enjoyable and uplifting experience, where the success of the students is shared by their peers, by staff and by families. Among those receiving prizes was Keane Barber, who was awarded Erin’s Gift for outstanding progress in Design and Technology. Erin Crotty was a St Mary’s student who sadly died in 2011. An award in her memory was presented by members of her family. Rotary Club awards were presented by Aireborough Rotarians Graham Davies and Brian Whitham. The musical contributions to the evening were described as excellent, with music provided by Matthew Overton, Olivia Nelson, Frances Jezzard, Rebecca Hyde and Caragh Casserly. We are delighted that Sir Gary Verity is able to join us at our Year 11 Achievement Evening as our Guest Speaker.